In the lead up to his newest book, With Their Bare Hands, Gene Fax examines the strange paradox of US-invented machine guns. This is the second part of a three-part article describing how American inventors developed almost all of the machine guns used in World War I, yet the US mostly ignored the weapons until the very eve of its entry into the war. Part I dealt with the Maxim and Benét–Mercié guns. Isaac Newton Lewis graduated 11th in his West Point Class of 1880 and ascended rapidly in the artillery hierarchy, serving at the Board of Ordnance and Fortification and as an instructor at the Coast Artillery School and inventing several fire-control devices along the way. In 1910 a firearms company asked him to design a machine gun based on patents they owned, in return for stock in the firm. (The line between military duties and profit-making ventures was more ambiguous then than now.) He obliged, and in 1911 produced an air-cooled, gas-actuated prototype that weighed 25 pounds and fired .30-caliber ammunition at up to 750 rounds per minute. In 1912 the gun made its debut at an airfield in College Park, Maryland, atop a Wright pusher biplane. The aerial firing was technically a success, but as the demonstration was unauthorized and the Army considered airplanes suitable for reconnaissance only, the stunt backfired. Presented to the Board of Ordnance and Fortifications, the gun got a cool reception. 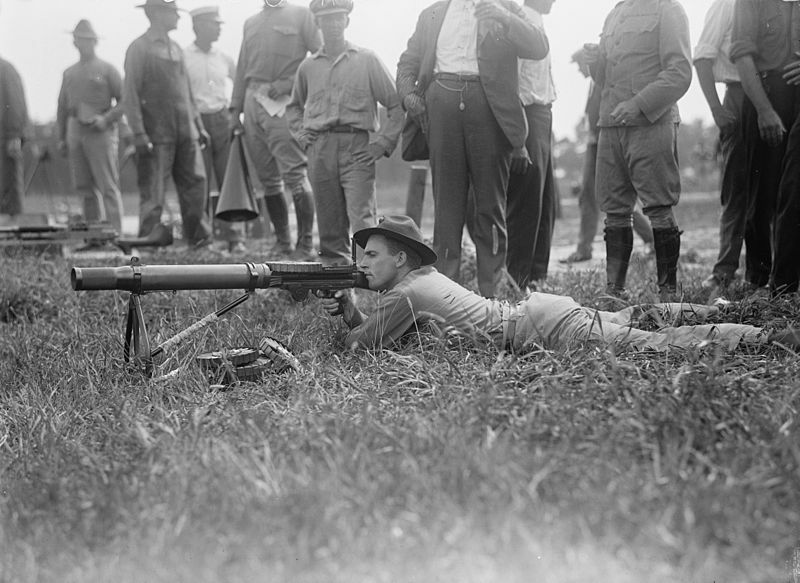 In 1916 the US Army’s Chief of Ordnance, General William Crozier, justified the Army’s failure to accept the Lewis gun on the grounds that the 1913 prototype had been proven defective and that the manufacturer had since failed to deliver models that could be subjected to the Army’s field test protocol. But at least part of the reason was the personal rivalry between Lewis and General Crozier. Close contemporaries, their careers in the Ordnance Board paralleled each other. Lewis was jealous that Crozier had been made Chief instead of him. Crozier thought Lewis unethical for privately patenting and selling some of his inventions, and he refused to designate some of Lewis’s fire-control devices as standard equipment. The upshot was that in 1913 Lewis resigned his commission and departed for Europe, taking his gun with him. Lewis set up a manufacturing firm in Birmingham, England, then the world center of small-arms production. He continued to improve the weapon, adding a cooling jacket (which made the gun instantly recognizable) and a fire-rate controller. The feed system, based on a circular pan mounted flat above the receiver and holding 47 (for ground use) or 96 (for aerial use) cartridges, allowed one man to operate the gun, in place of the normal machine gun complement of three or four men. The first use of the Lewis gun was by the Belgians in August and September 1914, although it never became their regulation weapon. In October, 1915, the British adopted it as the standard machine gun for infantry, replacing the heavier Vickers, which was assigned to specialist machine gun units. The gun became ubiquitous on British and French aircraft and was mounted on tanks as well. By the end of the war the Americans and the British had produced 50,000 of them. Even the Russians bought 10,000 from the British. Unlike the Army, the US Navy latched onto the Lewis gun quickly. In September 1917 a lieutenant commander, sent to Europe to examine the Allies’ weapons, delivered a test model to the Navy’s Bureau of Ordnance. The Bureau quickly approved its purchase and by January 1918 had enough on hand to arm and train the Marines. But when the Marines reached France they were brigaded with Army units, which were using French automatic weapons. Much to their disgust, the Marines’ Lewises were confiscated and were replaced with the highly unsatisfactory Chauchats. Colonel Lewis, whether out of patriotism or disillusion with the Army, returned his US royalties, totaling over a million dollars, to the US Treasury. The Chauchat, the only widely used automatic weapon not invented by an American, offers a striking contrast to its competitors. In 1903 the French government, looking for a lightweight automatic firearm, adopted a Hungarian design that used a long-recoil actuating system. It weighed only 19 pounds, but the long recoil rendered it hard to handle and thus inaccurate. Cheaply made from crudely finished stampings and industrial tubing, its manufacturing tolerances were so loose that parts were not interchangeable. It often overheated. It frequently jammed and its open-sided magazine was easily clogged or damaged. Lawrence Stallings, an American author and a former Marine who lost a leg at Belleau Wood, wrote, “When it jammed, the stoppage was generally remedied by throwing the gun away.” But despite the deficiencies of the Chauchat, the US had no other light machine gun – the Benét–Mercié had disproven itself (see Part I) and the Browning Automatic Rifle was not yet in production – so in August 1917 the Army ordered 24,000 of them, to be re-chambered from the French 8 mm to the more powerful American .30-06 cartridge. This made the problems worse. Eventually they were issued to nine divisions as they departed for France. The final part of this article will deal with the Hotchkiss and Browning machine guns. For Part I, click here. With Their Bare Hands - General Pershing, the 79th Division, and the Battle for Montfaucon by Gene Fax will be published on the 23 February and is now available for pre-order. Click on the link on the book title to see more and place your order.